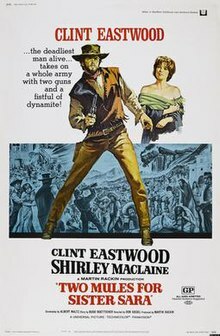 Two Mules for Sister Sara is a 1970 American-Mexican western film directed by Don Siegel and starring Shirley MacLaine (billed above Clint Eastwood in the film's credits, but not on the poster) set during the French intervention in Mexico (1861-1867). The film was to have been the first in a five-year exclusive association between Universal Pictures and Sanen Productions of Mexico. The film marked the second of five collaborations between Siegel and Eastwood, following Coogan's Bluff (1968). The collaboration continued with The Beguiled and Dirty Harry (both 1971) and finally Escape from Alcatraz (1979). The plot follows an American mercenary who gets mixed up with a nun and aids a group of Juarista rebels during the puppet reign of Emperor Maximilian in Mexico. The film featured both American and Mexican actors and actresses, including being filmed in the picturesque countryside near Tlayacapan, Morelos. Ennio Morricone composed the film’s music. Just after the American Civil War, a former soldier, Hogan, rides up on a naked woman about to be raped by bandits. Hogan kills the bandits, showing not only that he can shoot, but that he is an expert with explosives. He is taken aback when he sees that the woman he has saved is a nun. Sister Sara is raising money to assist Mexican revolutionaries who are fighting the French. When Sara requests that Hogan take her to a Mexican camp, he agrees because he had previously arranged to help the Mexican revolutionaries attack the French garrison in exchange for half the garrison's treasury, if they are successful. As the duo heads towards the camp, Hogan is surprised that the nun drinks his whiskey. Before he attempts to detonate a charge to destroy a French ammunition train, he is shot with an arrow in the shoulder. Sara is able to bandage him, but he is still unable to shoot the charge to disable the train himself. Sara assists him in aiming his rifle, and the two succeed in destroying the train together. Eventually the two reach Juarista commander Col. Beltran's camp and Sara reveals the layout of the French garrison. She then reveals to Hogan that she is not a nun but a prostitute posing as a nun. Although Hogan is shocked, the two team up, infiltrate the fortress and open the gates for the Mexican revolutionary forces to swarm through. A battle ensues. Hogan singlehandedly guns down several French soldiers. The French retreat and the Mexicans capture the fort. As promised, Hogan receives half the riches. Now wealthy and his job completed, Hogan sets off with Sara, whom he has fallen in love with, to open a gambling house in San Francisco. Budd Boetticher, a long term-resident of Mexico renowned for his series of Randolph Scott westerns, wrote the original 1967 screenplay that was bought with the provision that he would direct. Boetticher had planned the film for Robert Mitchum and Deborah Kerr, who had played a man of action and a nun in Heaven Knows, Mr. Allison. Kerr's character was a member of the Mexican aristocracy escaping the vengeance of the Mexican Revolution, with Mitchum's cowboy protecting her as he led her to safety to the United States. Carrol Case sold the screenplay to Martin Rackin, who had Albert Maltz, also living in Mexico, rewrite the story. Maltz's version had Clint Eastwood playing a soldier of fortune for the Juaristas and Shirley MacLaine playing a revolutionary prostitute now set during the French intervention in Mexico. The film saw Eastwood embody the tall mysterious stranger once more, unshaven, wearing a serape-like vest and smoking a cigar and the film score was composed by Ennio Morricone. Although the film had Leonesque dirty Hispanic villains, the film was considerably less crude and more sardonic than those of Leone. Boetticher expressed disgust with MacLaine's bawdy character obviously not looking like a nun as opposed to his idea of a genteel lady whose final revelation would have been more of a surprise to the audience. Though Boetticher was friends with both Eastwood and director Don Siegel, Siegel understood Boetticher's dislike of the final film. Boetticher asked Siegel how he could make an awful film like that with Siegel replying that it was a great feeling to wake up in the morning and know there was a check in the mail, while Boetticher replied it was a better feeling to wake up in the morning and be able to look at yourself in the mirror. Eastwood had been shown the script by Elizabeth Taylor during the filming of Where Eagles Dare with the view of Taylor playing the female role. The role of Sister Sara was initially offered to Taylor (Taylor then being the wife of Richard Burton), but she had to turn down the role because she wanted to shoot in Spain where Burton was making his latest film. Sister Sara was supposed to be Mexican but Shirley MacLaine was cast instead. Although they were initially unconvinced with her pale complexion, Eastwood believed that the studio was keen on MacLaine as they had high hopes for her film Sweet Charity, in which she played a taxi dancer. Both Siegel and Eastwood felt intimidated by her on set, and Siegel described Clint's co-star as, "It's hard to feel any great warmth to her. She's too unfeminine and has too much balls. She's very, very hard." Two Mules for Sister Sara marked the last time that Eastwood would receive second billing for a film and it would be 25 years until he risked being overshadowed by a leading lady again in The Bridges of Madison County (1995). The film was shot over 65 days in Mexico and cost around $4 million. Many of the cast and crew, including MacLaine, were stricken by illness while filming due to the adjustment to the food and water in Mexico. Bruce Surtees was a camera operator on the film and acted as a go-between for Siegel and cinematographer Gabriel Figueroa, which led to his working on Siegel's next film The Beguiled. Figueroa used many photographic filters for effects in the film. Eastwood revealed that he actually killed a rattlesnake for a scene in the film, as Mexican authorities did not want it released in the area after filming was over. Eastwood noted that he did not want to kill it, as he is opposed to killing animals. The film returned $4.7 million in North American domestic rentals, rendering it a solid, modestly profitable hit (a movie's gross is often close to twice the domestic rentals figure). Two Mules for Sister Sara received moderately favorable reviews, and Roger Greenspun of the New York Times reported, "I'm not sure it is a great movie, but it is very good and it stays and grows on the mind the way only movies of exceptional narrative intelligence do". Stanley Kauffmann described the film as "an attempt to keep old Hollywood alive—a place where nuns can turn out to be disguised whores, where heroes can always have a stick of dynamite under their vests, where every story has not one but two cute finishes. Its kind of The African Queen gone west". In a review by the Los Angeles Herald-Examiner, Two Mules for Sister Sara was called "a solidly entertaining film that provides Clint Eastwood with his best, most substantial role to date; in it he is far better than he has ever been. In director Don Siegel, Eastwood has found what John Wayne found in John Ford and what Gary Cooper found in Frank Capra." The New York Times in its book, The New York Times Guide to the Best 1,000 Movies Ever Made included Two Mules for Sister Sara in its top 1,000 films of all time. Author Howard Hughes joked that critics "couldn't argue that Eastwood's acting was second to nun." ^ Kauffman, Stanley (August 1, 1970). "Stanley Kauffman on Films". The New Republic. This page was last edited on 4 February 2019, at 00:35 (UTC).